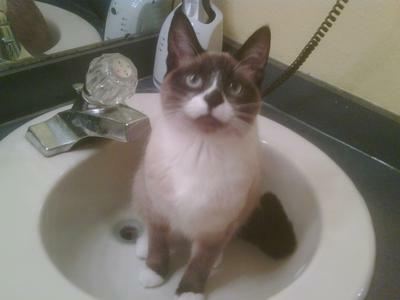 This is Snow, our Snowshoe kitty. I adopted her when she was only two weeks old. Two elderly ladies found her abandoned beneath the hedges in their yard. They could not care for her, so they gave Snow to me the day after they found her. My husband and I named her Snow because she was pure white when we first got her. The first few weeks were hard because I had to feed and potty her every two hours, but it was extremely rewarding, and we bonded very strongly. Snow slept in a box on the floor beside my bed for her first weeks of life, that way when she cried for food during the night I could wake up and feed her. I'm a very light sleeper. Snow is the sweetest kitty I have ever owned. She is a people kitty, and when strangers visit, she greets them, demanding attention as if the strangers came to see her. Snow has a way of demanding to be center stage of all the humans in the room! Snow loves water, and will cry to go outside when she sees it is raining. She follows me from room to room and never wanders too far from my side. She always sleeps on top of me at night. She is three years old now, and she is every bit as playful as when she was a kitten, and just as talkative too! Snow might be a cat, but after the first few days of bottle-feeding her, I quickly began thinking of her as my own child. I'd been told this would change when I had kids, but I now have my first daughter, and though I do love my daughter deeply, I still think of Snow as my child and love her deeply as well. She is truly a blessing in my life. Thanks so much, Marie, for sharing Snow's story here, and congratulations on bringing her up from such a young age. It's not easy feeding and looking after an abandoned newborn kitten, and you obviously did a really good job with her. I can quite see how you'd consider her as one of your children; I think all of us with cats can relate to that, even if we didn't bottle feed them from tiny kittens! The kitten age chart - are you older or younger than your cat?